LOS ANGELES (January 9, 2014) – In a survey of more than 1,600 discerning travelers conducted by leading luxury travel website Luxury Link (luxurylink.com), Croatia and Portugal were tabbed as up-and-coming destinations for 2014, while adventurous and foodie-focused vacations are being planned in the coming year. Among global respondents – who each indicated their total annual household income is $100,000 or higher – 29.7% stated they are most interested in visiting Europe this year while 27.3% are Caribbean-bound. For the Europhiles, 60.5% listed major cities as such as London, Paris and Rome as their primary area of interest. Two European nations, Croatia and Portugal, were named trending travel destinations in the coming year*. Among Caribbean sun-worshippers, Turks and Caicos was the most popular island choice, followed by the British Virgin Islands and Saint Lucia**. These high-end travelers will not be sitting idle during their 2014 vacations: 46.3% plan to incorporate adventures such as hiking, sailing or SCUBA diving into their trips, while 40.7% are foodie-focused, centering travel around fine dining and/or cooking classes. A worldly bunch, almost 55% are planning multiple trips abroad of two or more nights this year. “Must-have” hotel amenities for 2014 include free WiFi (75.7% of respondents), early check-in/late check-out (53.6%) and free daily breakfasts (47.1%). 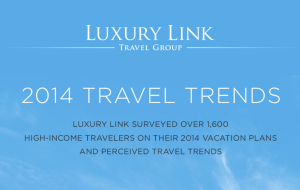 To view the accompanying 2014 luxury travel trends infographic, click here. The aforementioned survey was conducted on LuxuryLink.com from December 12-23, 2013. 1,667 respondents indicating that they have an annual household income of $100,000 or more are included in these survey results. Luxury Link, www.luxurylink.com, is a luxury online destination for booking curated hotels and travel experiences – a sophisticated resource for savvy travelers offering luxury accommodations with signature extras at insider prices. Luxury Link inspires a passion for travel by connecting people to the world’s most extraordinary hotels, resorts & vacation experiences. We set the stage for the moments that will shine in our travelers’ memories.